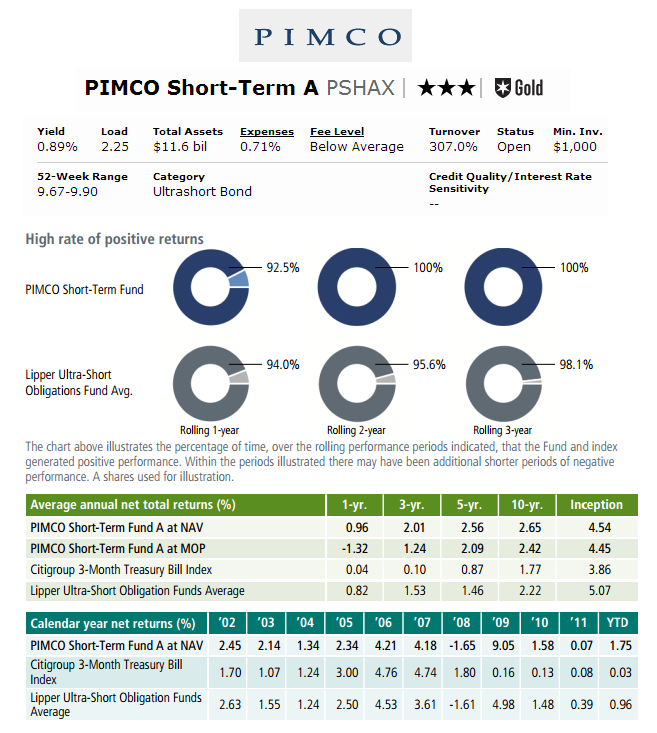 Since 2011, this ultrashort bond fund has been managed by Jerome M. Schneider. This best fund has a yield of 0.89%. Its net annual expense ratio is 0.71% and it includes 12b1 fee of 0.25%. The total net assets are $11.63 billion. It is ranked 3-stars and Gold rating by Morningstar. The effective maturity is 0.95 years and the effective duration is 1.16 years. The fund shares price is $9.91 (as of 12/1/2012). To start investing in this bond mutual fund, you will need to a minimum initial investment of $1,000 for regular brokerage account. 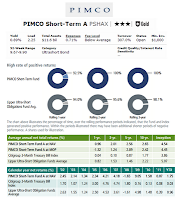 PSHAX can be purchased from 109 brokerages such as Vanguard, JP Morgan, Merrill Lynch, Schwab Retail, Td Ameritrade Inc, EP Fee Small, E Trade Financial, Royal Alliance, Raymond James, etc. Please check with your mutual fund broker for details. As of September 30, 2012, the fund’s year to date (YTD) performance is 2.77%. This taxable bond fund has returned 2.48% over the past 10-years and 2.04% over the 5-years. This percentage rank in category is 19%. The fund benchmarks are Citigroup 3-Month Treasury Bill Index and Lipper Ultra-Short Obligation Funds Average. As of June 2012, the sector diversification as per Market Value Weighted is Investment Grade Credit (35%), Government-Agency (21%), Mortgage (14%), Other (14%) and Emerging Markets (5%). The other classes of this fund are Class B (PTSBX), Class C (PFTCX) and Class R (PTSRX). According to the fund’s prospectus, the principal investment risks are interest rate risk, credit risk, high yield risk, market risk, issuer risk, liquidity risk, derivatives risk, equity risk, mortgage-related and other asset-backed risk, foreign (non-U.S.) investment risk, Currency risk, leveraging risk, management risk, short sale risk, etc.